Oxford, a quiet, sophisticated shoe with a sleek grace that adds charm to any pair of pants. How nice. Now, let us tell you about an Oxford that goes beyond dressing up your khakis to delivering high-tech comfort and heavy duty protection. 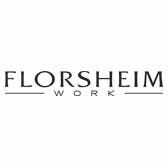 Florsheim's FS2430 Men's ... (see full details) (see specifications) #FLSFS2430. Oxford, a quiet, sophisticated shoe with a sleek grace that adds charm to any pair of pants. How nice. Now, let us tell you about an Oxford that goes beyond dressing up your khakis to delivering high-tech comfort and heavy duty protection. Florsheim's FS2430 Men's Composite Toe SD Lace-Up Shoes are the Working Man's Oxford. Made with Full-Grain leather, the uppers of these shoes are durable and abrasion-resistant for extra oomph with every step you take. The long-wearing polyurethane outsole is oil- and slip-resistant, which means you'll stay steadier on your feet and your shoes will stay stronger even on the harshest working terrain. An ASTM-approved composite toe will keep your feet safe from damaging impact without setting off the metal detectors. Thanks to the static dissipative feature of these oxfords, you can shuffle across shag carpet and touch your laptop without worrying about sending shock waves through your index finger. Let's talk about the inside of these Florsheims. A Tailex and Cambrelle lining will keep your feet cool and dry no matter how much you sweat. Florsheim's 3D polyurethane midsole helps soften the impact of cement floors. The removable F2A dual-density cushion insert is made with shock-absorbing polyurethane which helps absorb shock. Florsheim's FS2430 Men's Composite Toe SD Lace-Up shoes are not your ordinary oxfords. These brown beauties are high-powered oxfords' designed to keep you comfortable and strong all day long. I have had this shoe for about 3 years and I still wear them daily. It is a comfortable shoe and has really held up. I walk the plant floor and up & down stairs all day. A great shoe. I have two complaints with this shoe. 1) The sole of the shoe has worn out after one year of daily wear. Mostly walking across the parking lot and an occasional walkdown inspection of the plant (I'm an engineer). The sole is severly worn at the heel and recently became unglued at the instep. I expected more service life out of this shoe. 2) The shoe is too wide. I have a normal width foot and ordered a normal width shoe. However, the shoe is loose even the laces draw up as much as possible. This shoe might look like an ordinary work shoe, but let me tell you, it is very comfortable and easy on the ole feet. The sole really puts some nice cushion between me and the cement floor. I would buy these again. 21 out of 24 people found this product review helpful. I think the Working Person web site is the greatest on the web. It is really easy to work. I also like these shoes. Wear them daily. After wearing for 9 months and most of the time walked on carpet and tiles and pavements, one of the shoe's sole starting falling off. The leather is thick. but after 9 months wear, it is still relatively hard as compared to other steel toe shoes that I have in the past. Florsheim Shoes: Men's FS2430 Composite Toe SD Oxford Work Shoes is being added to your cart.